Commissar Ploss returns to book reviews with Salvation’s Reach. The latest novel in the Gaunt’s Ghosts series of books. Note: this is an advanced review. The book will be available for purchase starting October 2011. Well folks, i’ve finally managed to get another review done. Please forgive the delay. 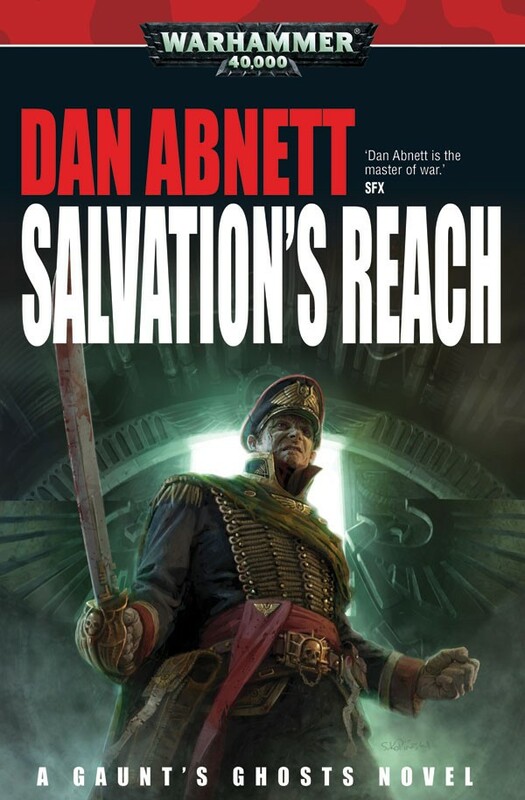 I was graced with an early look at Dan Abnett’s new book Salvation’s Reach and i have to say, i loved it. Plain and simple. I could simply save myself the trouble and end the review there but what kind of fan would i be! Suffice it to say that at the end of Blood Pact the regiment of the Tanith First leaves Balhaut for the planet Menazoid Sigma. Our wonderful cast of characters is back in action once again; the knife-edge that is Major Rawne, Gol Kolea, Ban Daur, Elodie Dutana (Daur’s significant other), Commissar Viktor Hark, Junior-Commissar Nahum Ludd, and Tona Criid to name a few. Together, along with a fresh influx of Belladon troops, our intrepid heroes mount a covert assault on the place known as Salvation’s Reach. They have with them a person who is key to the operation. A defector of the Archenemy. His head is filled with secret know-how and information that is vital to the mission and it’s success. Naturally, his safety is of the utmost importance, and likewise, challenged at every turn! Rawne, and the self-appointed “Suicide Kings” are charged with the safe-keeping of this person after an attempt on the defector’s life. After much travel through the warp, and one outstanding void battle later, the Ghosts launch a two-pronged attack on Salvation’s Reach. One; straight through the front door, loud, large, and in charge. The second; two small insertion raids that are carried out behind enemy lines so to speak. Gaunt leads this sneaky attack on key areas of Salvation’s Reach, in order to gather vital intelligence and artifacts that Imperial forces can use to dismantle the Sanguinary Lords and finally win the Sabbat Worlds Crusade! Salvation’s Reach has proven, once again that Dan Abnett is at the top of his game. And even though authors like Aaron Dembski-Bowden are giving him a run for his money, this book clearly demonstrates his mastery of literature. A thoroughly engaging read, this book is bloody brilliant! reason: Salvation’s Reach is an outstanding novel. The characterizations are classic Abnett, in the sense that they are fething superb! The pacing doesn’t slow for one moment and will have you constantly turning pages. Thrilling, truly thrilling! There’s not a fault in this book, and believe me, i looked… looked very hard. Should you buy this book? YEEEEESSSSS!